Everybody knows that an elephant doesn’t forget. In “Tachaaan!” we further learn that an elephant does know how to get even. “Tachaaan!” is a funny animated film done by Rafael Cano (Rafiki), Carlos del Olmo and Miguel A. Bellot. It is produced by Nicolás Matji at La Fiesta Producciones. It will remind you of some Tom and Jerry moments while you’re laughing like a kid in some of the scenes — if you’re in a good mood. At the start of the film, the viewer is taken to a quiet circus, where the cast and crew are presumably rehearsing or resting before another busy showtime night. 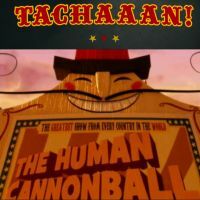 Enter the “human cannonball,” who happens to be vain and mischievous, the type that seeks and creates trouble. The graphic work on his character is so creatively convincing that you could almost smell his arrogance and vanity on the screen. One could assume that he’s become who he is because the victims of his mischief ignore him or don’t fight back. So no one has stopped him yet. And so it was hilarious when he finally met his match – an unforgetting elephant who will do whatever it takes to get even. Their little pranks and chasing are all visually exciting because of neat graphic work. The film’s ending is a bit cliche on the karmic side, but it doesn’t affect the general feel of the movie, which is really fun and entertaining. “Tachaan!” is a relatively new animated film, but it has been gaining attention on different sites, so it is best to get it now, and be the first to tell your friends about this amazing short animation. Jazz de Marras took care of the music and they brought the right emotions and textures into the frames with their action-sync composition. Great job!